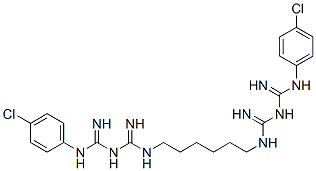 Cationic broad-spectrum antimicrobial agent belonging to the bis(biguanide) family. Its mechanism of action involves destabilization of the outer bacterial membrane. It is used primarily as a topical antiseptic/disinfectant in wound healing, at catheterization sites, in various dental applications and in surgical scrubs.